Before becoming a state park, Anderson Marsh achieved protection under the National Register of Historic Places in 1977 because of the work of a local archaeology student and resident named John Parker. Because of Parker’s fight to protect the area, the state purchased the property. Parker rallied the community to stop a plan to build condos on the marsh and established a need to protect the cultural sites where the Southeastern Pomo developed the now world-renowned baskets, made arrowheads from obsidian, created rock art and traded beads from magnesite and clamshells. They also constructed canoes, dwellings, dance lodges, sweathouses, sleeping mats and clothing from the abundant tule here. Anderson Marsh was the homeland of the Koi tribe of the indigenous Pomo. The nearby island village of Koi, named Indian Island on park displays and maps, was the “capitol for the Koi people,” said Dino Beltran of the Koi Nation tribal council. “My great grandfather was born on that island,” he added. California State Parks was unable to outright acquire the island, located less than a quarter-mile from the shores of Anderson Marsh. But to protect the village, which holds special significance to the Koi’s descendants, the state purchased 1.5 acres of the island through a conservation easement. This area is not open to the public. California State Parks is contracting with The California State University, Chico, Anthropology Department to produce a 26-minute film to highlight the rich prehistory of Clear Lake, the cultural history of the Koi and the unique and abundant natural resources of the area. Faculty and students in the university’s new National Science Foundation-funded facility will create the film with technology used by major Hollywood productions. They anticipate a fall 2014 release date to celebrate the park system’s 150th anniversary. Anderson Marsh’s rich cultural heritage stems from its natural abundance. Long before the name it acquired in the late 1880s, the tule marsh and wetlands here were so rich that as many as 1,000 native people were in settlement at a time, making Anderson Marsh one of the most densely populated areas of California in prehistoric times. Here the waters of Clear Lake empty into Cache Creek and then snake through the park’s tule marsh, forming islands and a rich habitat for thousands of birds and other wildlife. Trail access to the sites has been made better with new funding. The Cache Creek Nature Trail Boardwalk, newly repaired with grant funds from the California State Parks Foundation, the nonprofit that supports state parks, takes visitors along a wooden walkway to riparian habitat that otherwise could only visited by water. Tule reeds grow in thick stands along the shoreline. “This was a major plant in the lives of the Native Americans,” said Henry on a recent tour of the trail. "They boiled and ate the roots, made clothing and swaddling for babies and bundled it to construct canoes." A Pomo in a tule canoe. 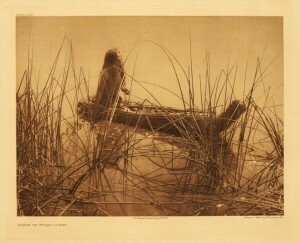 Photo: Northwestern University Library, Edward S. Curtis’s ‘The North American Indian’: the Photographic Images, 2001.